WiSA is neat tech. So I always make a point to put them on the list of groups to meet with at CES. There wasn’t much new this year; the chips still top out at a Dolby Atmos unfriendly channel count. Although as a “better” alternative to a soundbar (i.e good in a good/better/best) for the vast majority of consumers I can respect that it is not necessarily a critical feature. 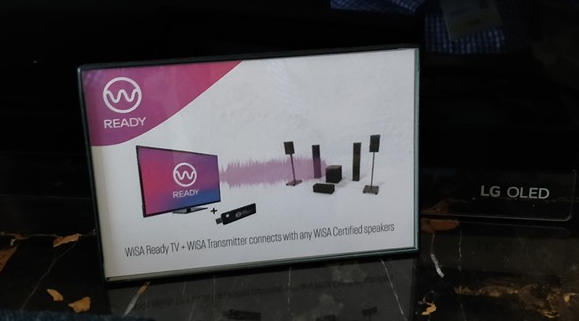 They have made good progress with the “WiSA Ready” branding realm, which will note products which will work with the USB dongle on display. Decoding is handled by the “ready” device, and each device will still need to provide the UI/UX to make the functionality make sense to end users. A few pictures of this experience on a 2019 LG OLED is included in the gallery above to show how vendors can implement this. As an LG TV owner, I was impressed by it. Just slots in like any other bit of UI configuration. I think this is a fantastic effort, hopefully one which will continue to lower the bar for entry into better sound quality for home theater enthusiasts. Complementing the dongle, Enclave Audio was showing off two 5.1 systems which should arrive in market later this year at the $999/$1299 price points.